On January 10, 2017, once again Ismatun had really bad stomach pain. But this time, she knew pills wouldn't be enough. She needed to go to the hospital. A local doctor had prescribed painkillers to manage the pain. But te pain was just too strong. Ismatun has had stomach pains for the last five years. Sometimes, her whole back hurt. She tended to ignore it to take care of the work at home and of her two daughters aged 2 and 8. 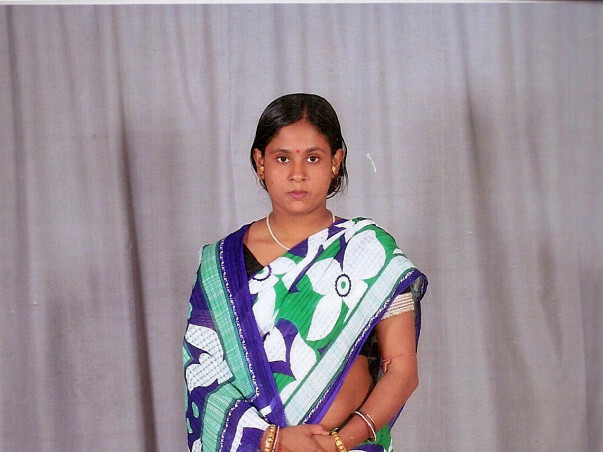 Her husband Suraj, concerned for her health insisted that she go to the hospital in their village – Sardanga, West Bengal. The doctor prescribed painkillers that she used to manage her pain and get on with her daily chores. Suraj finally saved up enough money and took her to a 'big hospital' in Calcutta. The doctor in Calcutta recommended Manipal Hospital, Bangalore and Suraj finally found hope that Ismatun would finally get better. At Manipal, Ismatun was diagnosed with chronic pancreatitis. This means her pancreas are inflamed and her condition will only get worse till it leads to permanent damage. It is a serious condition that significantly affects life expectancy. She urgently needs a surgery that will cordon off the inflamed parts of the organ. Suraj works on other people's farms and earns Rs 1,000-1,500 per month. A present, it is how much he has to spend every day. He is in Bangalore with Ismatun and they need to spend every day on room rent, food, medicines and conveyance. “Bangalore is a very expensive city. We have already spent Rs 18,000 in just two weeks. We have left the kids back home and every day they cry on the phone. After spending so much, it is very difficult not knowing where the money to treat my wife will come from,” says Suraj. Ismatun has undergone ERCP, Sphincterotomy, PD Clearance and stenting in October2016 and the stent was removed in December. 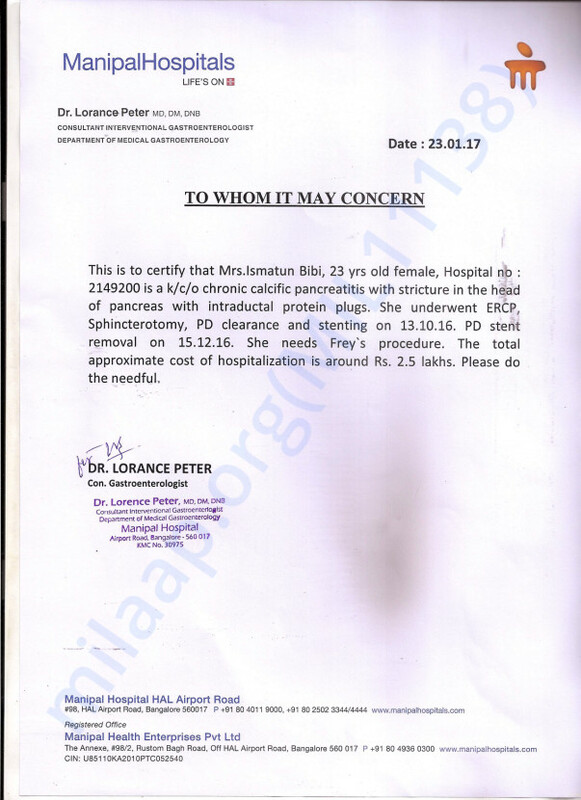 As the problem has not improved she needs to undergo Frey’s Procedure under Dr Nagaraj Palankar which will cost them approximately 2.5 lakhs. Suraj has taken loans from relatives and landlords and managed to arrange Rs 1.25 lakhs for her treatment. They have already deposited 1 lakh for her initial treatment and now need help getting the rest for her surgery. Despite the poverty and difficult circumstances, this farmer is trying very hard to get his wife the treatment she needs. Please contribute and show them that in these difficult times, they are not alone. Thank you so much for coming forward to help Ismatun. As Suraj (Ismatun’s husband) puts it - “I have no words to tell you on how grateful I am to everyone who has helped my wife “. She successfully underwent Frey’s procedure on the 6th of Feb and has had an uneventful recovery. She was responding well to the post-operative care and was stable. She has been discharged from the hospital and was asked to come back for a follow-up after 3 months. Ismatun is now back home and is doing well. She has a little pain on the operated side but is managing well with the medications. She is slowly learning to walk around and her eating habits are regular. “Both her daughters sometimes cry around her but eventually are happy that their mother has come home to them “– Says Suraj, with a lump in his throat. Thank you all for making this happen for their family. You have helped this family stay together. Please do wish for a speedy recovery too.